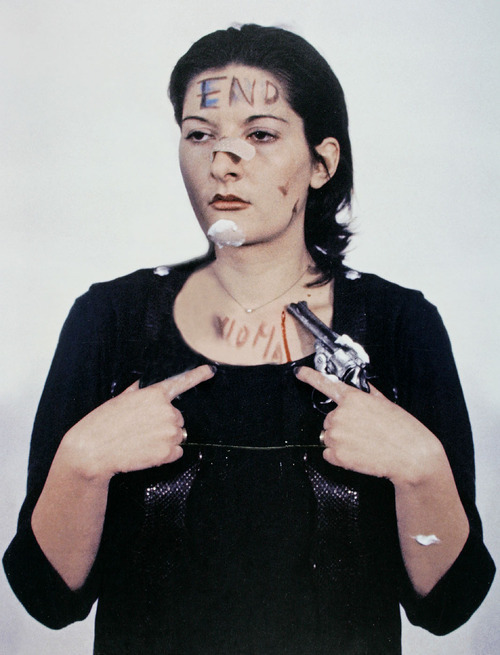 Meet the "grandmother of performance art"
Marina Abramović’s first series of performance art (1973-1974). 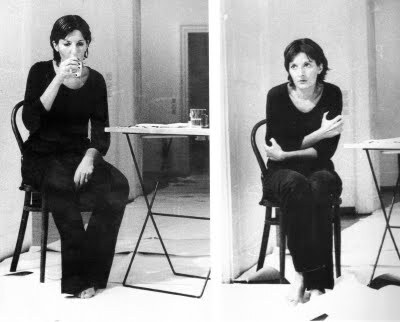 Between 1973-1974, Abramović performed five pieces in which she tested the mental and physical limitations of her own body. This series of performances, called “Rhythms,” represent Abramović’s turn away from more traditional media of painting or drawing, to instead focus on the use of her own body as art. Rhythm 10 (1973). 1 hour. The first performance of the Rhythm Series, Rhythm 10, is also Abramović’s first performance of her career. 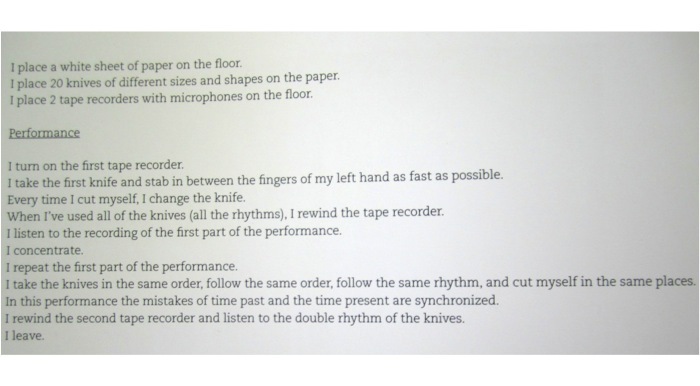 In Rhythm 10 Abramović adapts the Slavic knife game, called “five finger fillet” in which the player places their palm facing down on the table, then proceeds to attempt to stab a knife back and forth between their fingers at an increasing speed. The game holds a real risk of bloodshed and serious injury. Abramović, in her adaption of the game, increased risk by introducing a selection of twenty different knives of various sizes and shapes. Two tape recorders sat on the floor next to her, recording the rhythms of the knives. 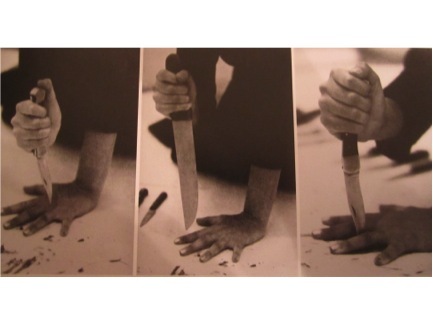 In this piece, once Abramović had inflicted ten wounds on herself, she stopped then returned to the knives and attempted to replicate the exact movements and cuts she’d inflicted the first time. 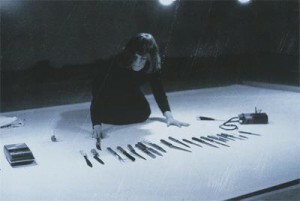 The performance was not over until Abramović had used every single knife twice. 1. Marina Abramović, Rhythm 10, 1973. Performance, 1 hour Museo d’Arte Contemporanea Villa Borghese, Rome From: Abramović, Marina, and Klaus Biesenbach. 2010. Marina Abramović: the artist is present. New York: Museum of Modern Art. “I turn on the tape recorder. I take the first knife and stab in between the fingers of my left hand as fast as possible. Every time I cut myself, I change the knife. When I’ve used all of the knives (all of the rhythms), I rewind the tape recorder. I listen to the tape recording of the first part of the performance. -Marina Abramović; instructions from the Rhythm 10 performance. 2. Marina Abramović, Rhythm 10, 1973. Performance, 1 hour Museo d’Arte Contemporanea Villa Borghese, Rome From: Abramović, Marina, and Klaus Biesenbach. 2010. Marina Abramović: the artist is present. New York: Museum of Modern Art. 3. Marina Abramović, Rhythm 10, 1973. Performance, 1 hour Museo d’Arte Contemporanea Villa Borghese, Rome From: Abramović, Marina, and Klaus Biesenbach. 2010. Marina Abramović: the artist is present. New York: Museum of Modern Art. 4. 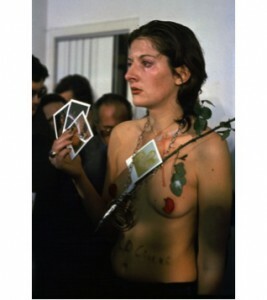 Marina Abramović, Rhythm 10, 1973. Performance, 1 hour Museo d’Arte Contemporanea Villa Borghese, Rome From: Abramović, Marina, and Klaus Biesenbach. 2010. Marina Abramović: the artist is present. New York: Museum of Modern Art. In these first three images one can see the white sheet of paper which Abramović lay on the floor below her. As Abramović completed her performance, her increasing bloodshed marked the paper, emphasizing her pain and sacrifice. 5. 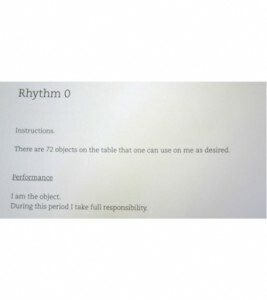 Instructions for Rhythm 10 Performance. 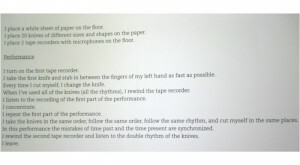 This image depicts Abramović’s instructions for the Rhythm 10 performance, an excerpt of which I included earlier in this post. Abramović’s adherence to her pre-set rules for the performance demonstrates her dedication to testing her mental and physical endurance through ritual and sacrifice. Rhythm 5 (1973). 1 1/2 Hours. 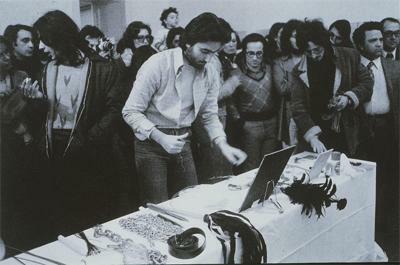 The second performance of Abramović’s Rhythm Series is Rhythm 5, which was performed in the Student Cultural Center in Belgrade in 1974. In Rhythm 5, Abramović constructed a five-pointed communist star from wood and wood shavings, hence the title Rhythm 5. She then soaked the star in 100 liters of petrol. 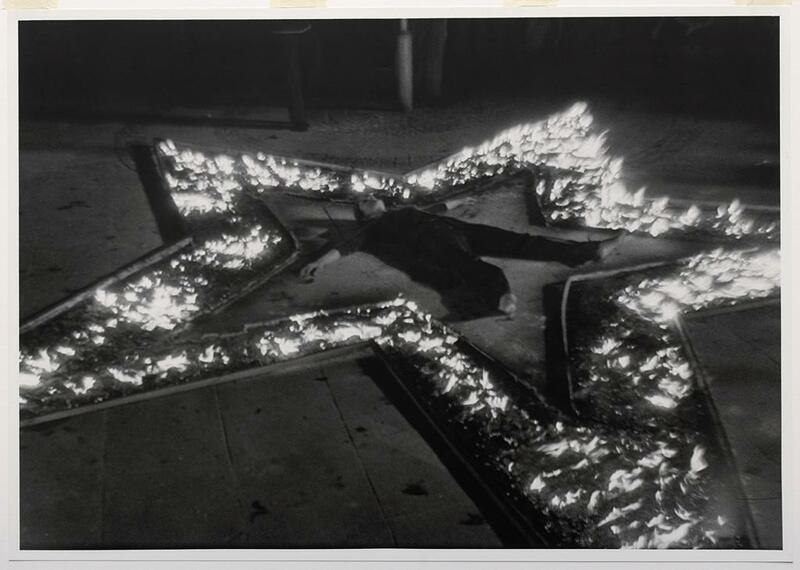 After setting fire to it, Abramović ceremoniously paced in a crucifixion pose, around the burning star. She then proceeded to cut her hair, and as she paced repeatedly around the burning altar, she fed bunches of it to each point of the star like a sacrificial offering. She followed this by then cutting her fingernails, followed by her toenails, which she also scattered among the five corners of the star. Only after having repeatedly circled the star and depositing her bodily offerings, does Abramović step into the star.As Abramović lay at the center of the burning star, the severity of the fire quickly absorbed the oxygen, causing her to lose consciousness. Upon realizing Abramović was unconscious, two audience members intervened, and removed her from the flames. Rhythm 5 began with the building of the five-pointed star, which was then soaked with petrol and lit on fire as shown above. The above image depicts Abramović in the process of cutting her hair in preparation to scatter it among the five points of the burning star like a sacrificial offering. 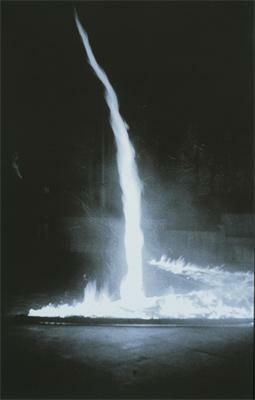 Here one can see Abramović lying at the center of the burning star not long before she lost consciousness and had to be rescued from the flames by audience members. Rhythm 2 (1974). 6 Hours. 9. Marina Abramović, Rhythm 2, 1974. Performance, 7 hours (total). Galerija, Suvremene Umjetnosti, Zagreb. For the first part of Rhythm 2 (seen in the image above) which took 50 minutes, Abramović took the pill meant for the treatment of acute catatonia. . Soon after ingesting the first pill, Abramović’s muscles began to seize up, until she was completely unable to control the movement of her body. While mentally she was conscious of what was happening, she was unable to physically react. 10. 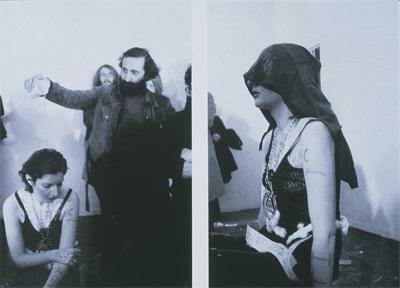 Marina Abramović, Rhythm 2, 1974. Performance, 7 hours (total). Galerija, Suvremene Umjetnosti, Zagreb. For the second part of the performance, Abramović repeated the defined steps of part one, but this time ingested the pill for schizophrenia. This medicine is meant to calm down schizophrenic patients who struggle with violent behavior. Similarly to the first part of the performance, Abramović soon lost control over her own body. This time what was sacrificed was Abramović’s sense of identity. During the five hours it took for the medication to wear off, Abramović was completely unaware of herself. Rhythm 4 (1974). 45 Minutes. The next performance in Abramović’s Rhythm Series is Rhythm 4, which was performed at the Galleria Diagramma in Milan later in 1974. For this piece Abramović kneeled alone and naked in a room with a high-power industrial fan. The performance was recorded and then projected for the audience in the room next door. As her act of sacrifice, Abramović slowly approached the fan and attempted to breath in as much air as possible, pushing the limits of her lungs. Soon after, Abramović lost consciousness. 11. Marina Abramović, Rhythm 4, 1974. Performance, 45 minutes. Galleria Diagramma, Milan. 12. 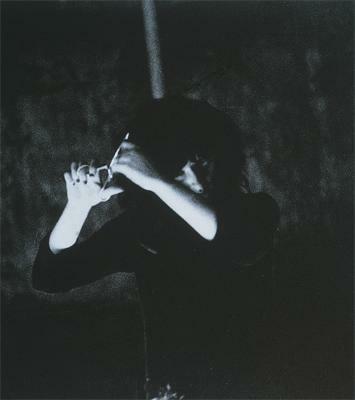 Marina Abramović, Rhythm 4, 1974. Performance, 45 minutes. Galleria Diagramma, Milan. In these first two images, one sees the naked figure of Abramović as she slowly approaches the industrial fan. She is in a small room by herself, separated from her audience who watches on a monitor next-door. 13. 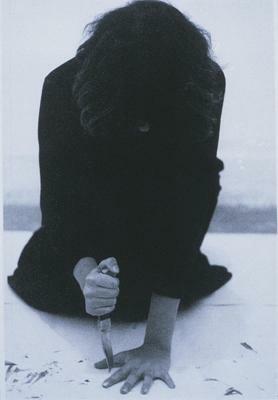 Marina Abramović, Rhythm 4, 1974. Performance, 45 minutes. Galleria Diagramma, Milan. Due to Abramović’s previous experience in Rhythm 5 when audience members intervened in the performance, for this piece Abramović made specific plans so that her loss of consciousness would not interfere with the completion of the performance. Before the performance began, Abramović instructed the cameraman to zoom in closely on her face without showing the fan (as seen in the final image), so that the audience would be unaware of her unconscious state, and less likely to intervene on her behalf. Unfortunately for Abramović, the morality of the audience hindered her physical surrender. After being unconscious for several minutes, the cameraman refused to continue, and sent gallery staff to help her. Rhythm 0 (1974). 6 Hours. The last performance of the Rhythm Series is Rhythm 0. Performed in the Galleria Studio Mora in Naples at the end of 1974, Abramović used this performance to challenge the division between performer and the passive viewer, by placing the power in the hands of the audience. On one of the gallery walls Abramović posted a label on which she stated, “I am the object. During this period I take full responsibility.” For the arbitrarily defined six-hour duration of this performance, from 8pm to 2am, Abramović sacrificed her body as an object to the whims of an increasingly aggressive audience. 14. 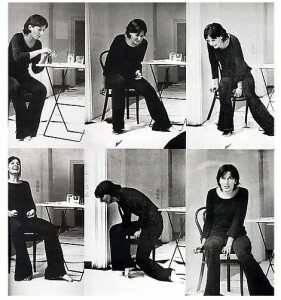 Marina Abramović, Rhythm 0, 1974. Performance, 6 hours. Studio Mona, Naples. 15. Marina Abramović, Rhythm 0, 1974. Performance, 6 hours. Studio Mona, Naples. While Abramović stood resolutely still, audience members had the opportunity to use any of the seventy-two objects Abramović had provided. These objects included items that could be used for pleasure, like perfume or sugar, and those that could be used for pain, such as razor blades or nails (you can see a picture of the table of “props” below). Abramović’s adolescent interest in the game of Russian roulette is also represented through the inclusion of a gun and one bullet on the table. By including potentially deadly objects to be used by the audience, the risk of death becomes palpable. 16. Marina Abramović, Rhythm 0, 1974. Performance, 6 hours. Studio Mona, Naples. 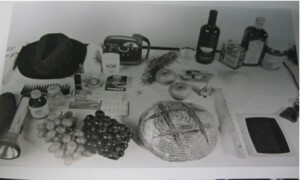 Table with the 72 objects to be used by audience members during the performance. 17. Marina Abramović, Rhythm 0, 1974. Performance, 6 hours. Studio Mona, Naples. 18. Marina Abramović, Rhythm 0, 1974. Performance, 6 hours. Studio Mona, Naples. 19. 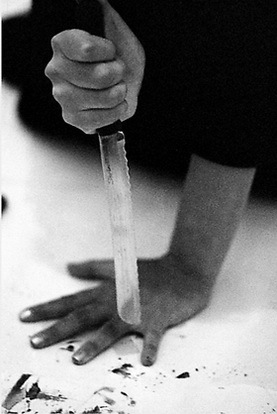 Marina Abramović, Rhythm 0, 1974. Performance, 6 hours. Studio Mona, Naples. In the first three hours of the performance the audience was relatively timid. She was moved into a variety of poses, her clothes were torn off, and she was written on with lipstick (images 18-19). However, as time passed, and Abramović continued to stare passively into space, the audience members became more aggressive. One person cut her neck with a razor blade then drank her blood. Another wove a thorn-covered rose around her neck. Finally, when an audience member placed the loaded pistol in Abramović’s hand, and pointed it at her chest, the performance was stopped (images 20-21). 20. Marina Abramović, Rhythm 0, 1974. Performance, 6 hours. Studio Mona, Naples. 21. Marina Abramović, Rhythm 0, 1974. Performance, 6 hours. Studio Mona, Naples. Learn more about Rhythm 0 by watching this brief but informative overview of the performance, narrated by Abramović herself.